Interested? Plan on a slow-paced, 12-mile tour of Seattle. You’ll see entire race teams in full kits, hipsters on fixies, city folk on city bikes, handcycles, and maybe even some Xtracycles (two last year!). Assuming you can ride safely in traffic, you’re encouraged to join with however you want to pedal. The ride is timed to start late enough that motorists see us sharing the streets, but not so close to rush hour that the ride becomes a Critical Mass-style traffic hindrance. The mood is serious, contemplative, civic, and positive. Quietly. update: Your city probably has a ride tonight, too. Find it <a hrefhttp://www.rideofsilence.org/main.php”>here</a> and then let us know how it went. 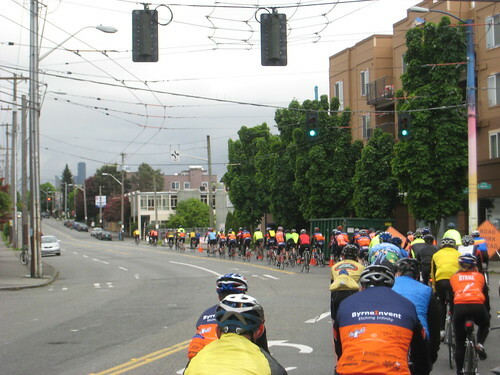 More Images and video from last year in the Car Free Days Ride of Silence flickr set. This entry was posted in alternative transportation, bigger than here, bikes, Human Powered Politics and tagged advocacy, bicycle, bikes, Commute, respect, ride of silence, seattle. Bookmark the permalink. it is really different I did it two years ago. It took forever to get through the traffic light on Stone Way & N34th. The ride does spread out a bit. Video was embedded in the comments of last year’s pre-ride post. A large chunk of it is just riders rolling off the University Bridge. I think it took a good four minutes.